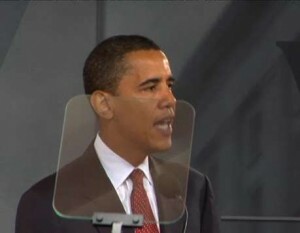 But what about Øbama’s teleprompters? I mean, look at the absolute control they have over that puppet? And, with most ventriloquists, you can at least see their throats working as they make their dummy speak. Not the teleprompters – nary a twitch! Incredible. Clearly, they are the world’s best ventriloquist team. This entry was posted on 31 January 2012 at 1201 and is filed under Humor, Politics. You can follow any responses to this entry through the RSS 2.0 feed. You can leave a response, or trackback from your own site. Personally I think it should go into the trash. Because I am sick of this. Especially when cbelerities and politicians go on about it. Good God, these are people who live in huge houses, has private jets and yachts, entourage of cars and they say the average citizen is to blame for their little global warming? It is all absurd especially if you truly look into it. Some of them know they lost and because of this now want to make it a crime to deny global warming. Look it up. It is all there. And it is all absurd. There is a reason why global warming enthusiasts never debate a real scientist but instead talk to people who either believe it or know nothing of Earth Science 101.